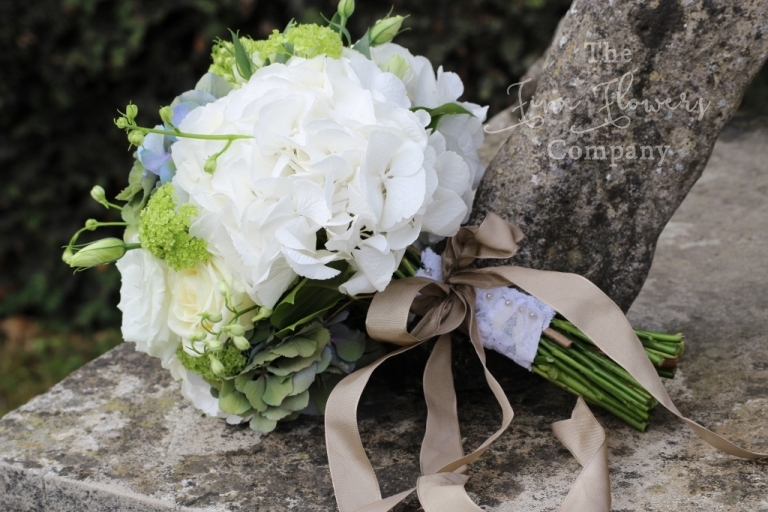 We returned to Great Fosters, where we are recommended suppliers, for another lovely Great Fosters outdoor wedding with beautiful flowers to match the stunning setting. Our most recent couple to brave the fickle British weather and take to the great outdoors for their wedding ceremony was Lynsey and David. Their theme was BoHo and informal, country style and natually romantic. 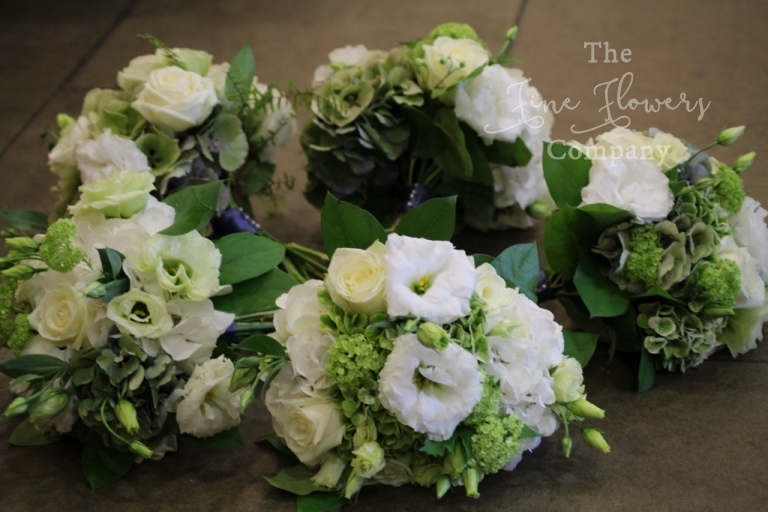 Lynsey opted for bloomy bouquets of hydrangeas, roses, lisianthus and green vibernum, arranged quite informally for both her and the bridesmaids. 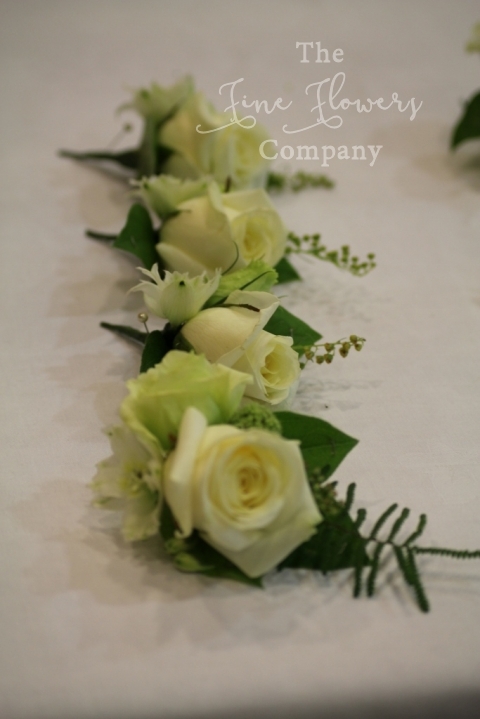 The men wore wilder style buttonholes with Avalanche roses, green lisianthus, delphinium buds and oregano and the mums corsages matched these on a more elaborate scale. We arrived at Great Fosters on a somewhat overcast day. The weather was warm but looking indicisive whether it will brighten up or start drizzling. Much to my surprise I found David and Lynsey full of confidence that the weather will hold dry and firmly intent on having the ceremony outside. Having a plan where the flowers would have looked and worked just as well inside we went with the brave couple’s decision to set up for an outdoor ceremony, which looked lovely and very much to Lynsey’s dreams. I left leaving a little apprehensive on their behalf but entrusted the great team at Great Fosters to work out a plan B just in case, ready to bring the displays back to the Orangery. For the Great Fosters outdoor wedding ceremony we created two lovely dramatic urns to add a focal point to the garden pavillion, and tied pretty posies of dreamy white gypsophilla to the garden chairs with inky blue ribbons to match the bridesmaids dresses. 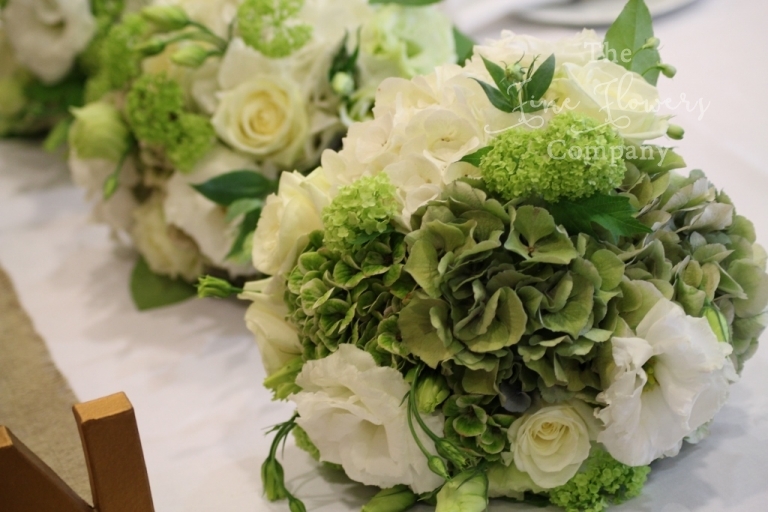 On the registrars table we lined up Lynsey’s unusual golden vases with bloomy displays of ivory, greeney gold and inky blue hydrangeas, with lisianthus, delphinium buds & gypsophilla. A very lovely blackboard framed the invite to ‘Choose a seat, not a side” – what a lovely way to put it! Following the Great Fosters outdoor wedding ceremony, we dressed the Orangery for the wedding reception. The banquet style tables were styled with tall dreamy vase displays of tall ivory delphiniums, with lower gold vases dotted in between, with lots of romantic candle holders. Lynsey had sourced large gold letter and numbers to place on the tables, to signify when the proposal took place as well as the wedding date. Making it even more dreamy, the ceiling was styled with lots of upside down ivory umbrellas hanging from light strings and a huge blackboard was set to one side of the room for guests to write their own comments on.